From runways to department stores, lace is everywhere and knitters are picking up their needles to chase the trend. Lace Style takes a fresh approach to this classic theme by combining solid techniques with 20+ contemporary projects. This stunning collection includes patterns for scarves, shawls, hats, sweaters, dresses and more – all with a modern twist by accomplished designers including Nancy Bush, Evelyn Clark, Norah Gaughan, Annie Modesitt, Shirley Paden, Michele Rose Orne, and more. Each pattern has detailed step-by-step instructions and lavish photographs with plenty of detail shots to keep readers inspired. 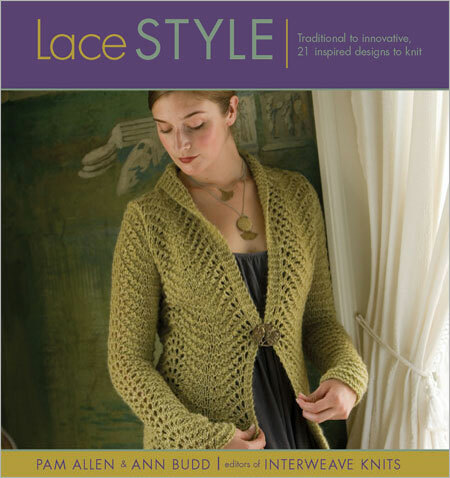 A special design chapter demystifies the elements of knitted lace, and details several ways to achieve lacy effects. It also provides key pointers on how to incorporate lace motifs into other patterns and tips to ensure success.